The External Modem tab provides settings that control operation when WinWarbler is sending and receiving RTTY or CW via an external modem connected to your PC via a serial port, via a transceiver controlled by Commander, or via another application. (screen shot). a file named External.txt that contains no command definitions for use with external decoders whose output is conveyed via an RS-232 port - including transceivers like the IC-7700 and IC-7800. You can modify the provided command files, or create files for other modem models using a simple command syntax. The send control characters from Transmit Pane box, when checked, routes control characters struck in the Transmit Pane other than CTRL-J, CTLR-Q, CTRL-R, CTRL-S, and CTRL-V to the external modem. 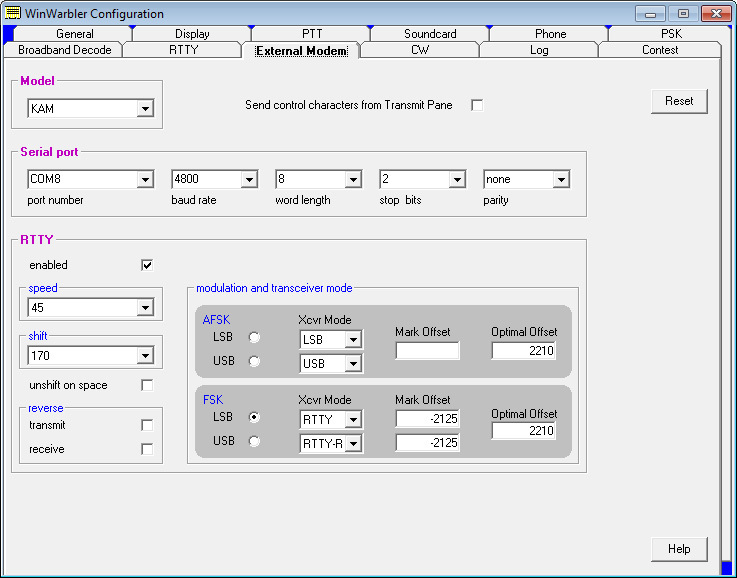 This allows you to directly control the external modem -- setting parameters or switching to another mode -- but means that keyboard shortcuts used to navigate among QSO Info panel textboxes will not function in the Transmit Pane. If this box is checked while in CW mode with keying via the external modem, the Auto Start and Auto Stop settings are unchecked and disabled; this prevents keystrokes intended to control the external modem from initiating transmission. Clicking the reset button sends an InitCmd to the external modem. The serial port panel lets you specify and configure the serial port by which your external modem is connected. The RTTY panel controls the RTTY operation of the external modem. note: Changes to either of the settings in this panel will update the reverse checkboxes in the Main window's Receive and Transmit panels. specifies a Mark offset (in Hertz) that aligns the displayed RTTY receive frequency with a known mark frequency when operating in AFSK mode; negative values are accepted. This can be used to compensate for an offset between your transceiver's VFO display and its actual frequency. specifies a Mark offset (in Hertz) that aligns the displayed RTTY receive frequency with a known mark frequency when operating in FSK LSB mode; negative values are accepted. This can be used to compensate for an offset between your transceiver's VFO display and its actual frequency. specifies a Mark offset (in Hertz) that aligns the displayed RTTY receive frequency with a known mark frequency when operating in FSK USB mode; negative values are accepted. This can be used to compensate for an offset between your transceiver's VFO display and its actual frequency.